Happy Friday, Friends! I hope you have had a good week. 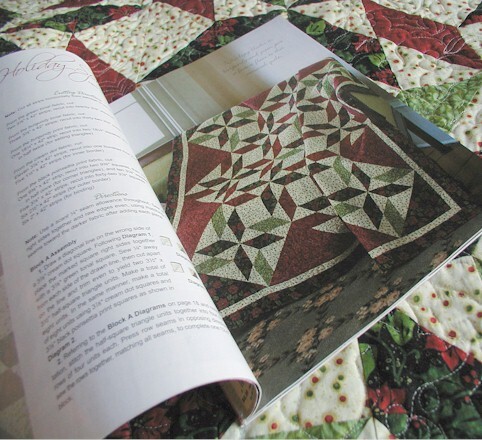 If you recall, I already have my Midwinter Night Pillow Project featured in the Holiday 2012 issue of The Quilter. 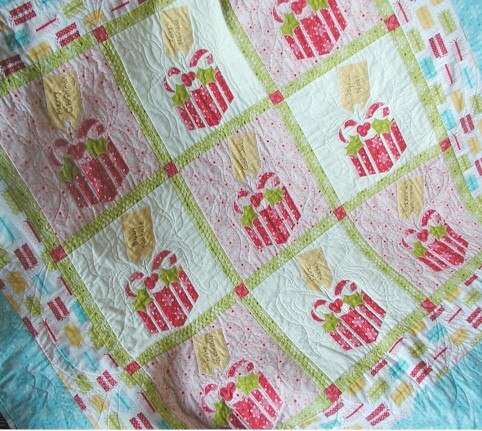 I am sharing with you today another project I did for that same issue — my Greeting Cards quilt. 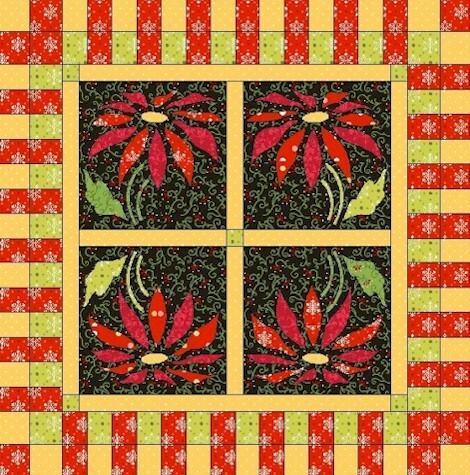 This design is an example of “one block wonder” quilts in that the overall layout of the quilt center is constructed with the same blocks, oriented differently. 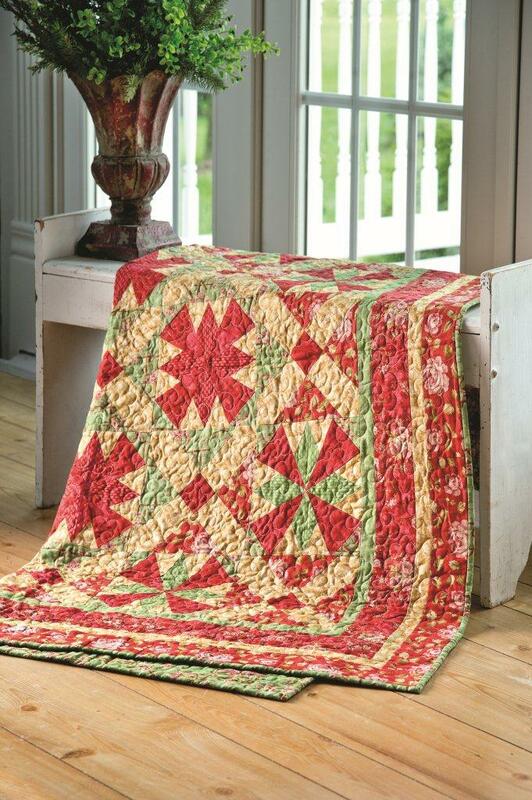 This quilt design utilizes narrow strips to accentuate the print fabrics. 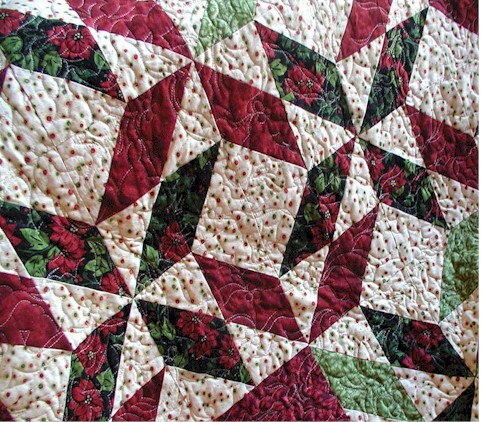 Some aren’t too fond of narrow strips – they really don’t handle any differently than regularly sized strips. Just make sure the blade in your rotary cutter is nice and sharp, and you will be just fine. 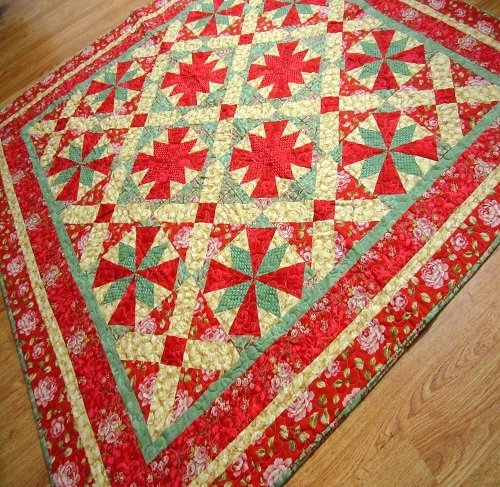 Sherry McConnell (vice president of the Quilter’s Hall of Fame) was my piecing elf for this quilt. 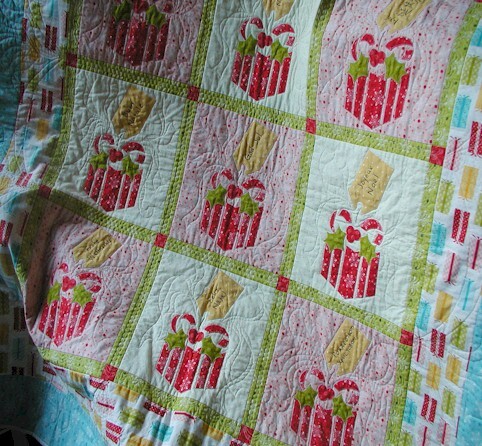 I sent her the fabrics, and she miraculously sent back the quilt top all ready for me to quilt! 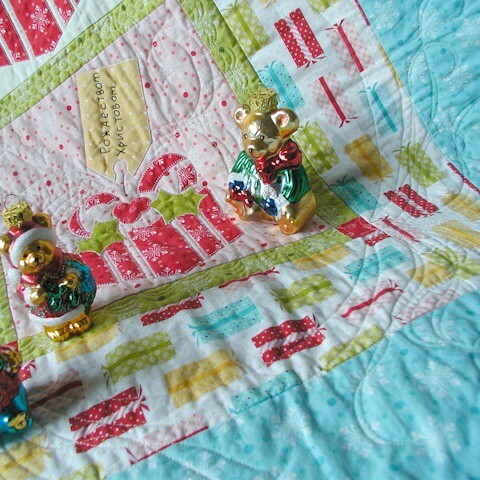 The fabrics I used are from Quilting Treasures’ Holiday Magic collection. 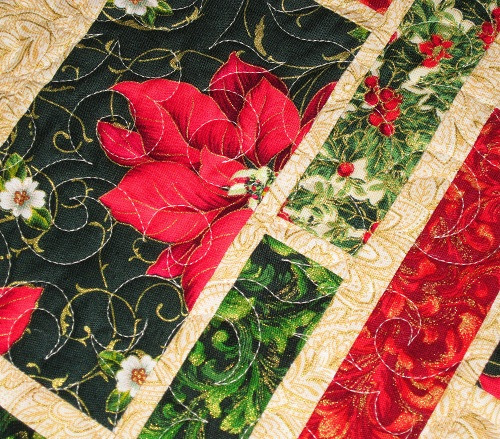 This collection has a total of 18 beautiful Christmas fabrics. 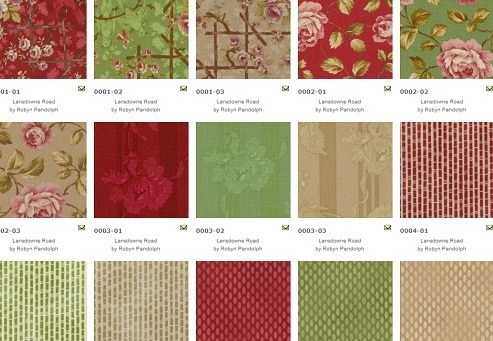 Click here to view the full range of fabrics. 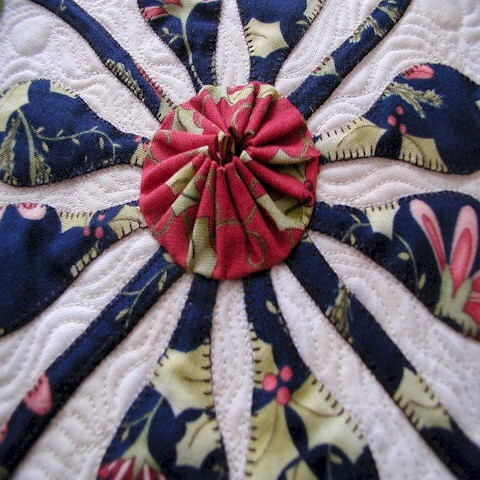 Quilting motif is my allover Jester’s Hat motif, quilted with Aurifil Mako 50 Cotton thread over Hobbs Tuscany Silk batting. 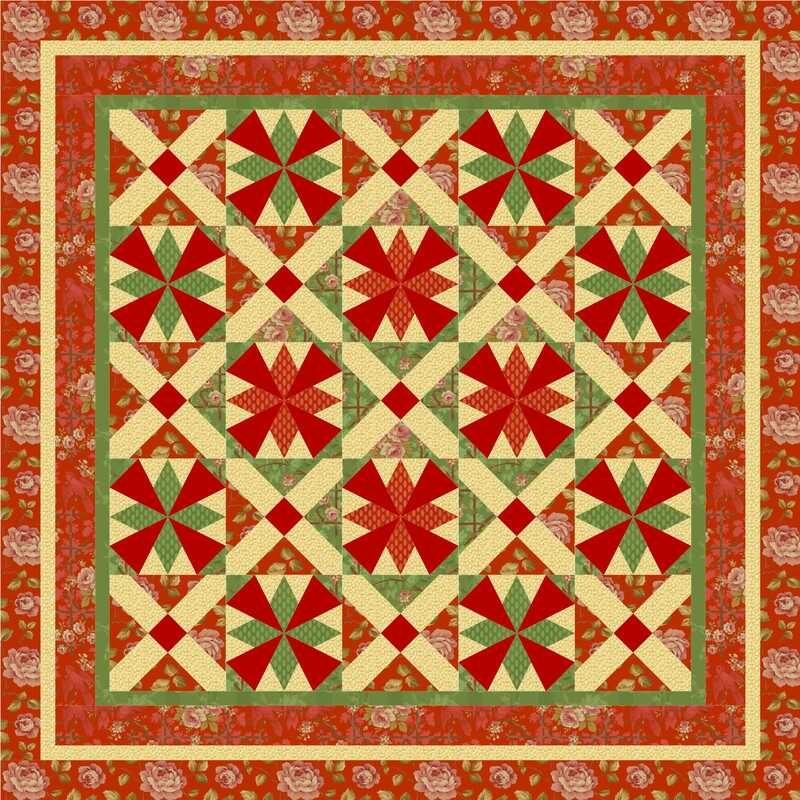 Kits are available from Quakertown Quilts while supplies last. 1-888-464-7845. 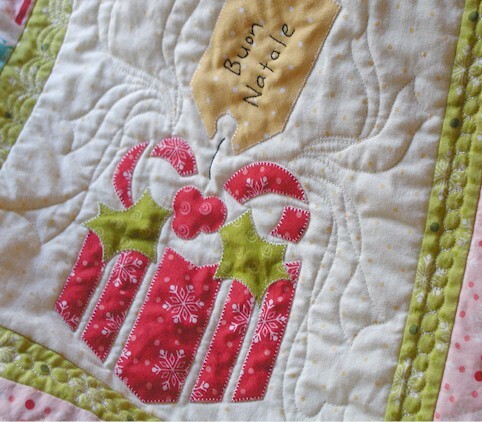 Are you sending out physical Christmas cards this year? I know that with the increasing electronic world we live in, some have relied on electronic cards. I am just curious. Have a lovely weekend! I will see you again on Monday with a Thread Talk post! Stay tuned. 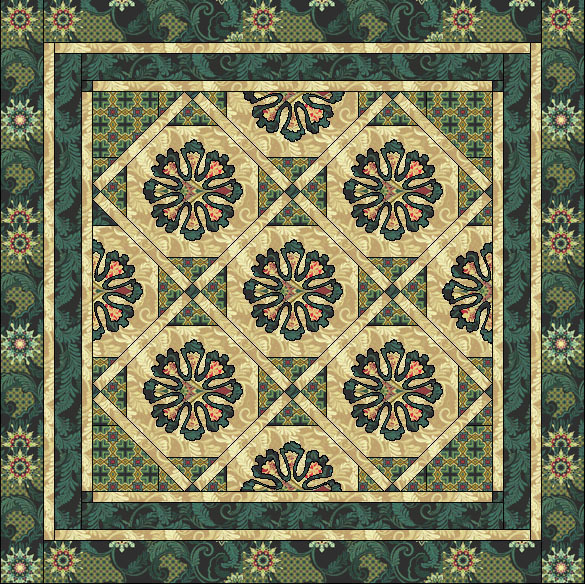 Hi Friends, here is another freebie for you – designed by yours truly for Benartex! It comes in two colorways. 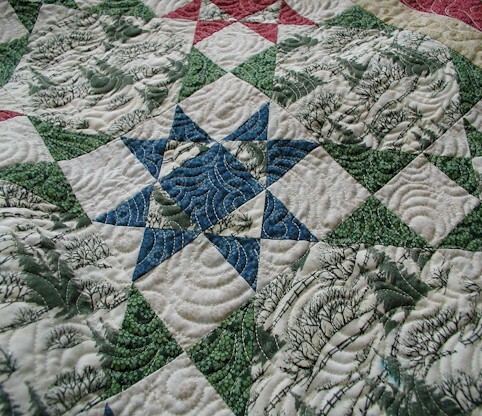 Click here to view the full range of the Star of Hope collection. 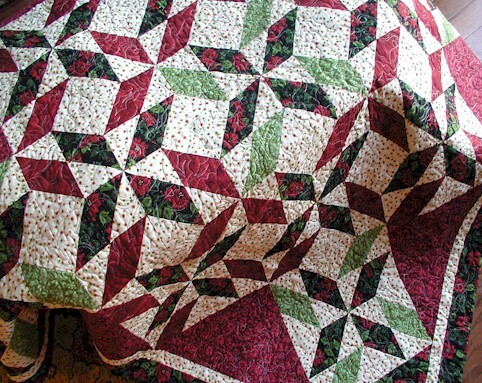 Click here to download the pattern instructions. 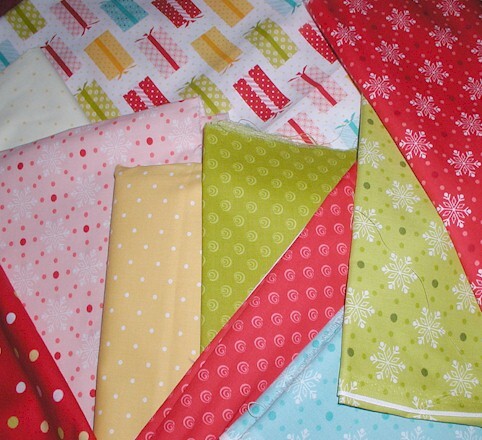 Stay tuned for my magazine feature quilt using some of these fabrics. Sorry for the quick post, but I have got to run for now. Talk to you later! p.s. Thanks for all of you who wrote and asked how we fared Sandy. We are doing well — power is still on. Good morning, Friends! I hope you are doing well. 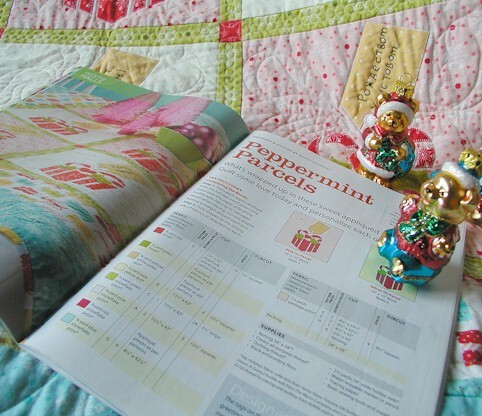 Besides Warm Blessings, I have a second quilt in Quilter’s World December 2012 issue. 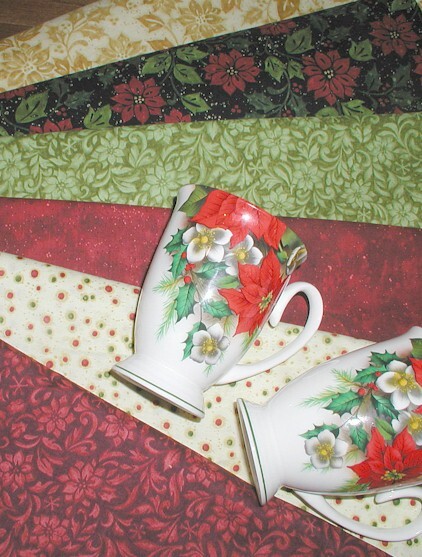 Come meet Cottage Chic Christmas! 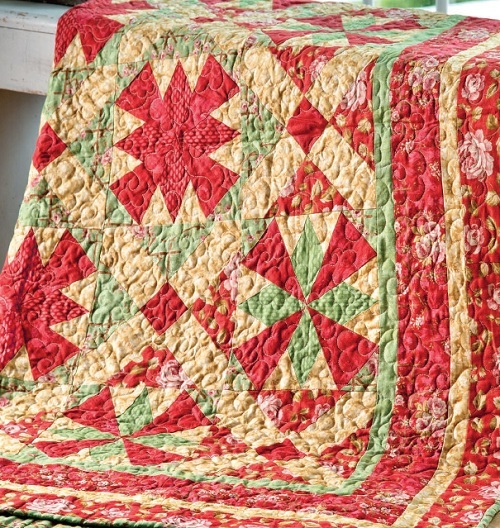 This is a two-block quilt that makes a rather loud visual statement with the fabrics used. 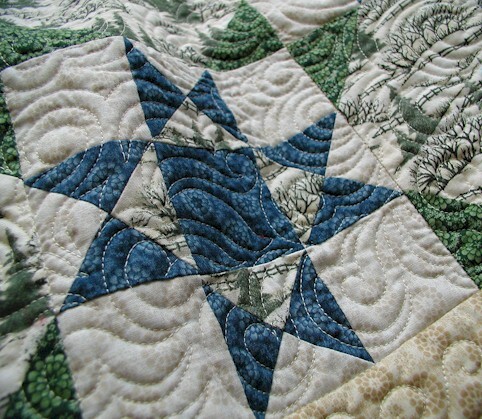 The blocks are constructed using rotary cutting (for the cross blocks), and paper-piecing (for the star blocks) methods. 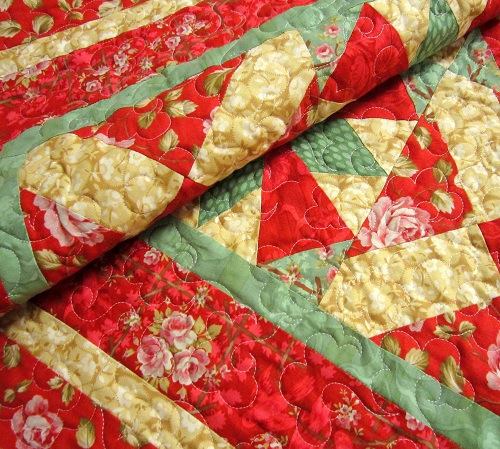 If you haven’t tried paper-piecing, perhaps this quilt would induce you to attempt… just sayin’! 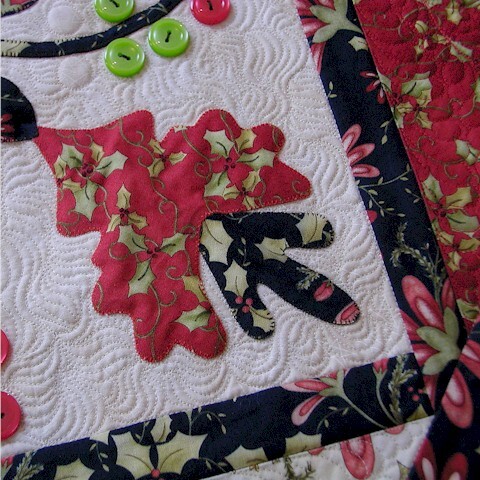 :) Here are a couple of paper-piecing tips I had posted about in the past — scroll down toward the bottom of the post. 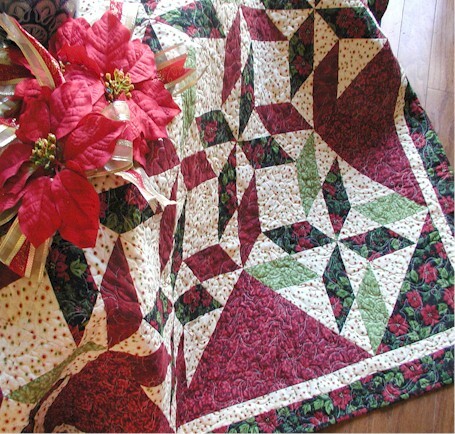 I used fabrics from Robyn Pandolph’s Lansdowne Road by RJR Fabrics for this Christmas quilt for versatility purposes. 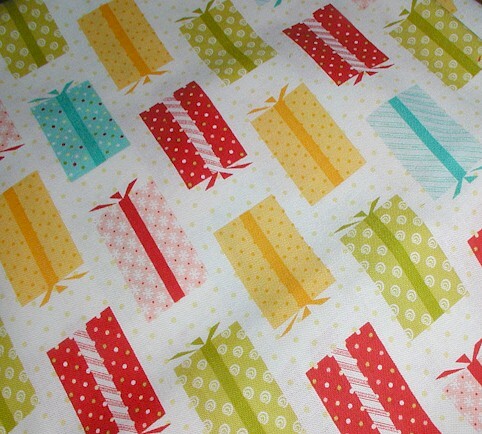 Click here to view the full range of fabrics. 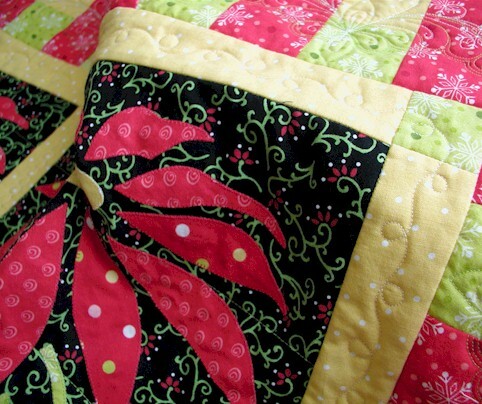 The colors of the fabric in real life are much more vivid. 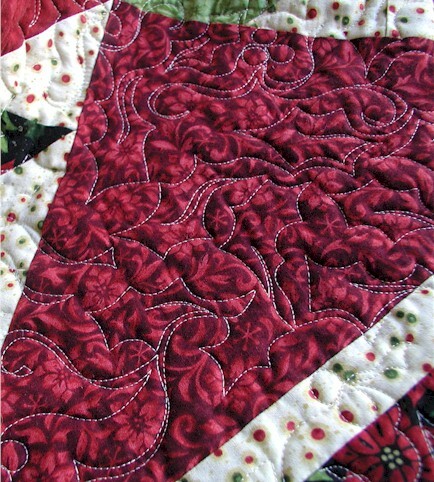 Quilting is an allover swirly floral motif! 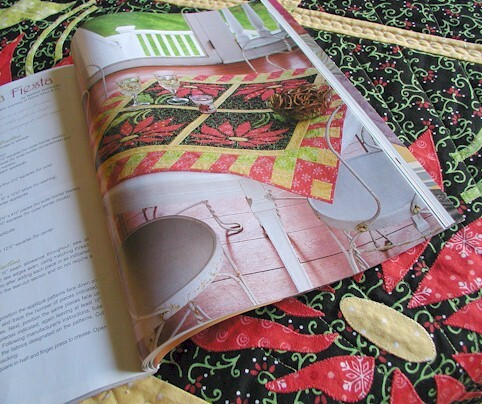 I am just absolutely elated how well the photographer captured the quilting in the official magazine shoot! Incidentally I have met this guy, and think that he is definitely very good at what he does! 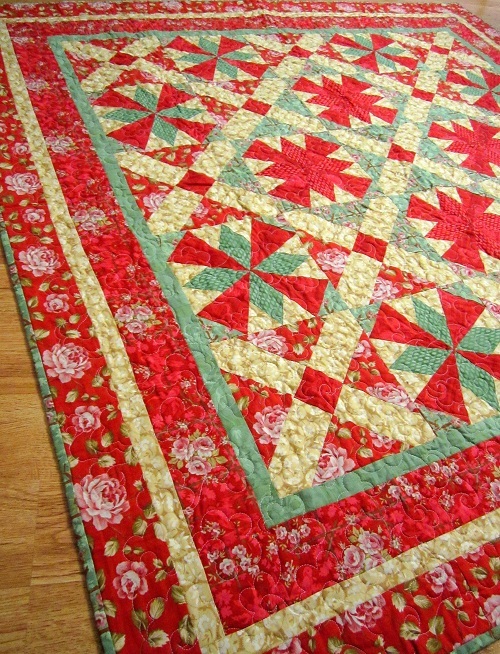 Quilting was done using Aurifil Mako 50 Cotton over Hobbs Tuscany Silk batting. 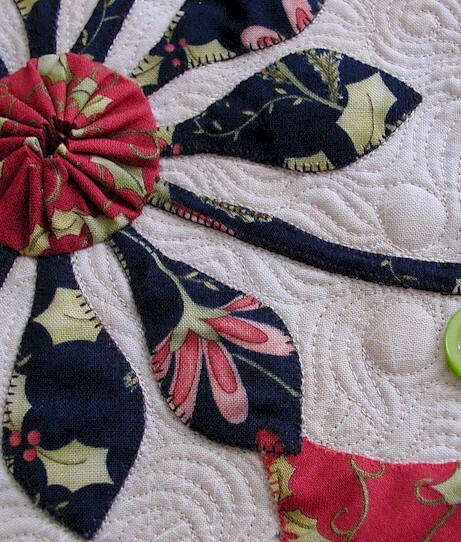 I have actually posted a tutorial on the floral motif here. 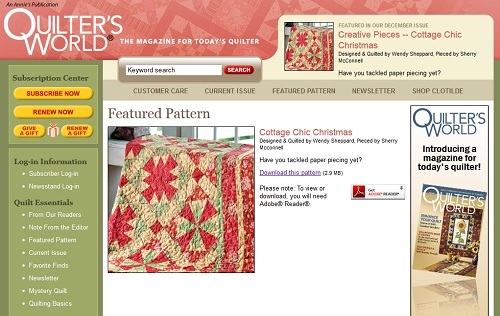 Oh, one more thing … for a limited time, you can download the pattern instructions for Cottage Chic Christmas from Quilter’s World’s website for free. Click here to access the instructions in pdf format. Isn’t that just so dandy? 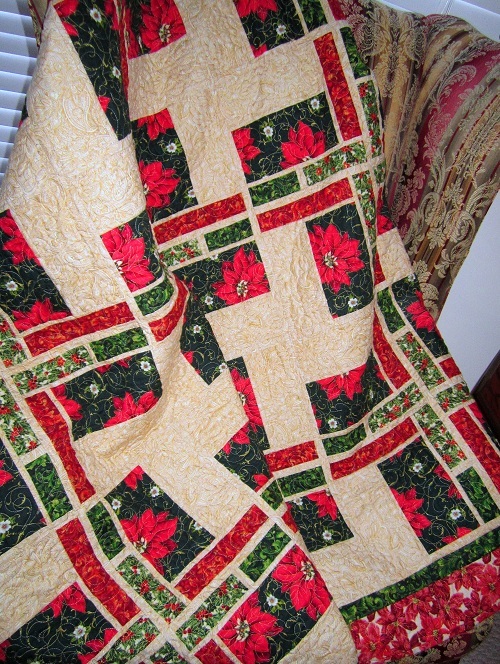 I hope you have enjoyed my Cottage Chic Christmas quilt. 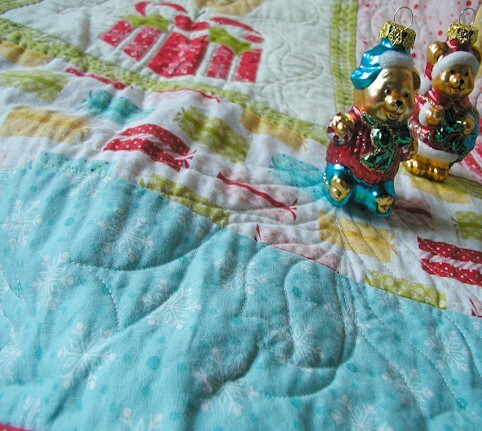 Christmas is going to be here before we know it. Miss Baby has already started talking about all the things we are going to do when we were browsing through a few Martha Stewart Christmas books this past weekend. She definitely has very high expectations — her poor mother who will never reach Martha’s caliber. Ha! Thanks for stopping by. Happy Monday, everyone! 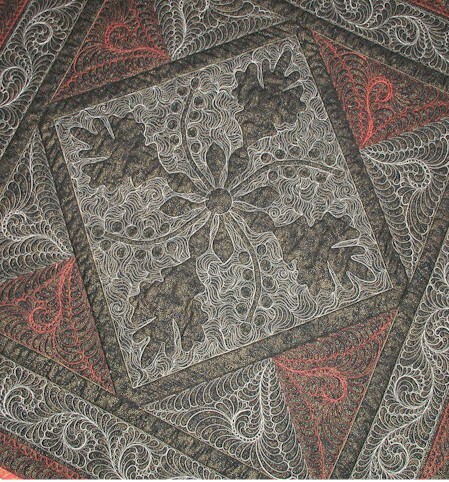 The traditional Coxcomb patterns date back to the 1860’s. 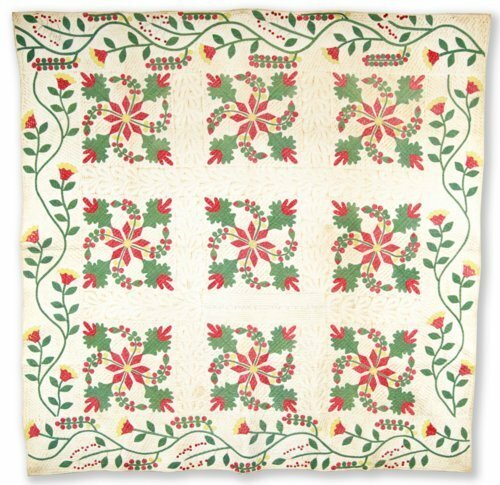 I was able to locate online one made in 1853 by Elizabeth E. Stark of Kansas. 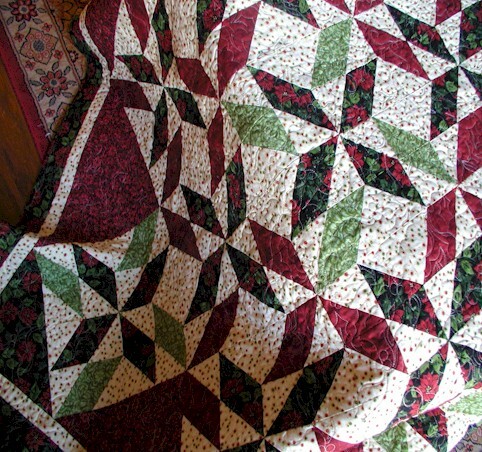 You will notice that Mrs. Stark’s quilt is made in the red/green, not uncommon from that period in history. 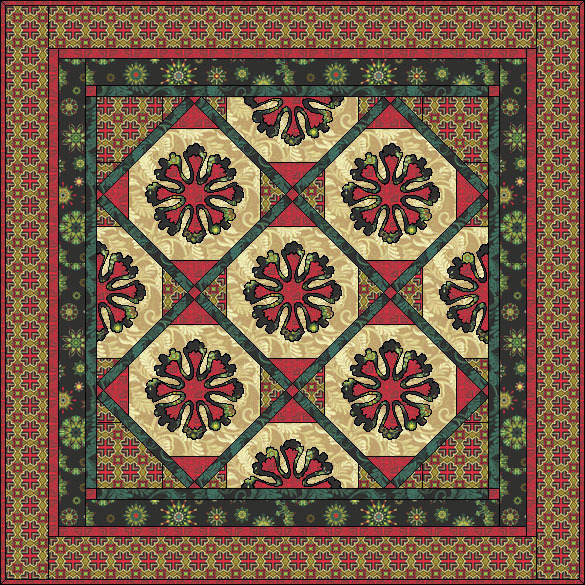 I used fabrics from Henry Glass‘ Love-Joy-Peace-Noel collection to make a playful Christmas version of this traditional pattern. Navy is introduced into the traditional red/green mix. 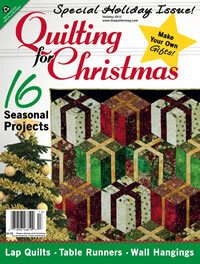 The quilt is featured in The Quilter‘s December 2011/Jauary 2012 issue. 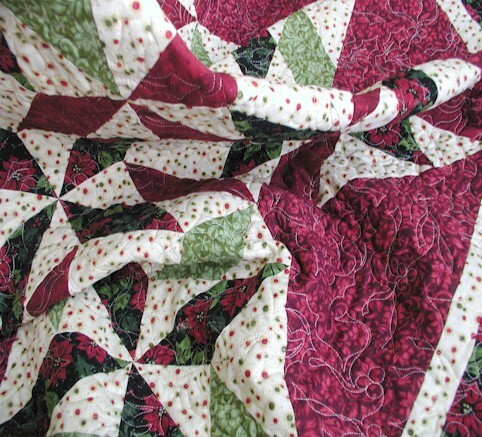 Some dense quilting (feathers, McTavishing) is thrown into the mix too! 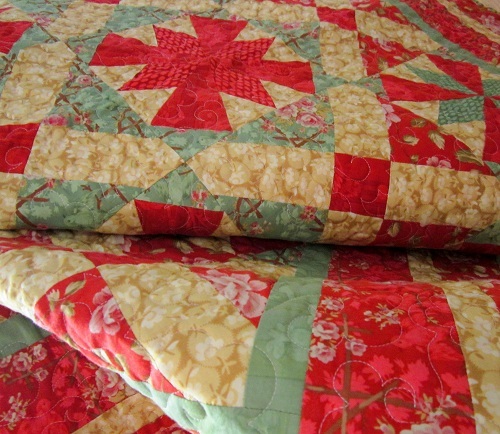 Quilting is done unmarked and free-handed, using Aurifil Mako 50 Cotton threads over Hobbs Tuscany Silk Batt. This is how the back looks. 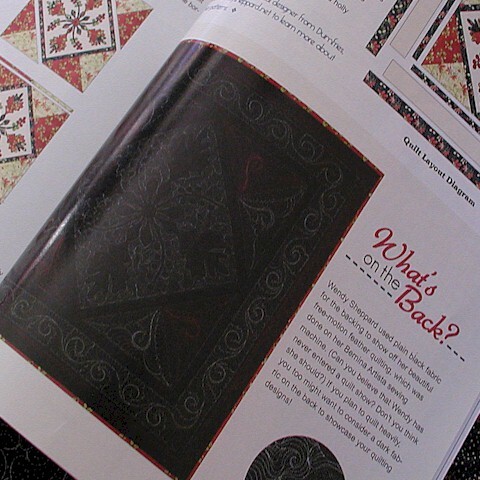 The editorial staff at THE QUILTER kindly included a full shot of the quilt back in the magazine spread. 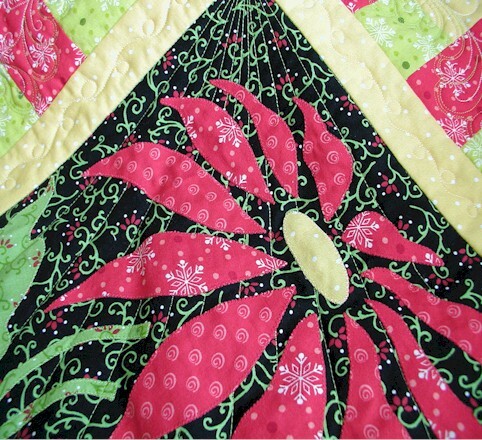 Applique was done using the machine fusible method. 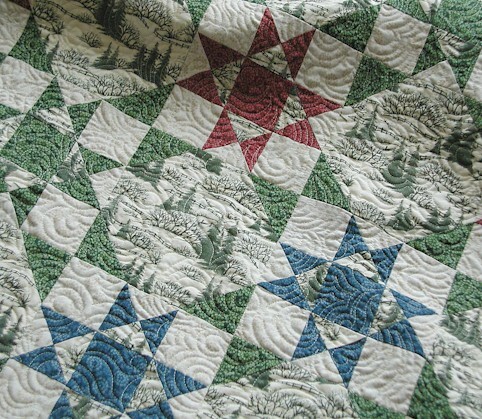 I used Steam-A-Seam2 by Warm Company. 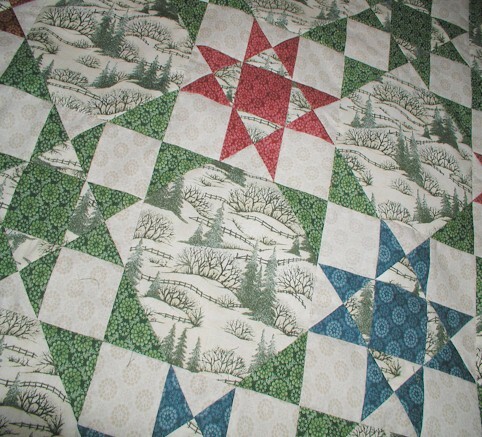 I was very happy at how this quilt turned out. It is one of my all-time favorites. 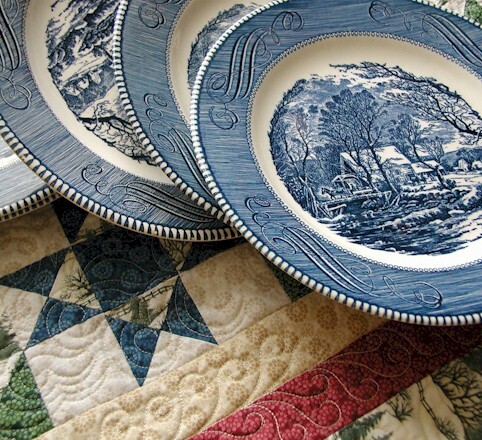 You will understand why I will be using it only for display and not at the table, won’t you? :) Thanks so much for stopping by. Christmas cheer to all of you! 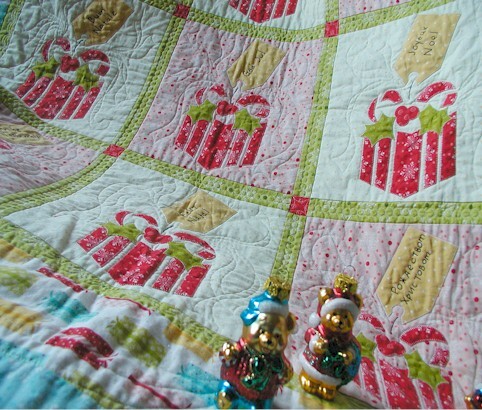 I am happy to receive in the mail my Peppermint Parcels Christmas Quilt, back from Quilter’s World. 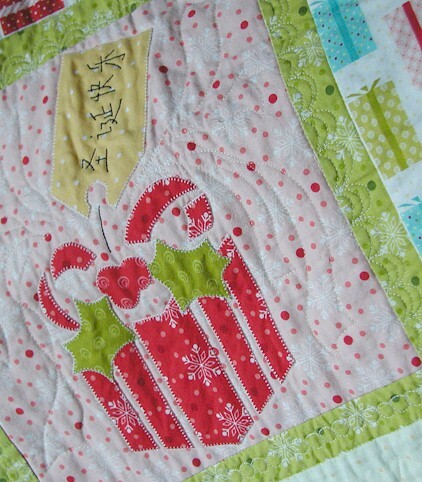 I stitched “Merry Christmas” in different languages on the gift tags. The church my family went to while I was growing up, and still does, is a Chinese church. So, we would greet friends at church “Merry Christmas” in Mandarin. 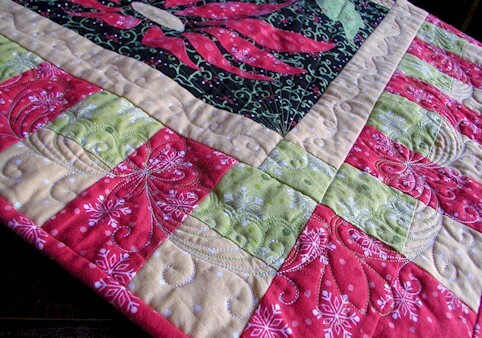 Additional streamers and garlands are quilted on the borders. 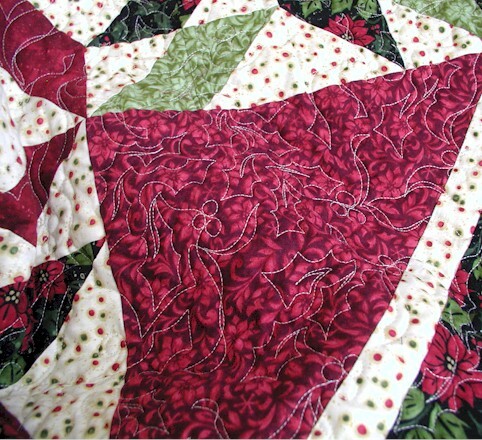 Stringed pearls and beads are quilted on the sashing to remember my love of decorating gift parcels with streamers and ribbons etc. 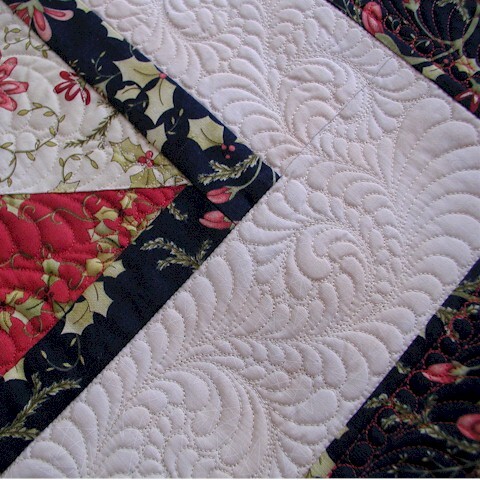 Technical information: Unmarked free-motion quilting on my Bernina 640; Quilting Thread – Aurifil Mako 50; Quilt Batting – Hobbs‘ Tuscany Silk (In case you haven’t already known, this is my favorite combination of thread and batting when it comes to quilting a quilt! 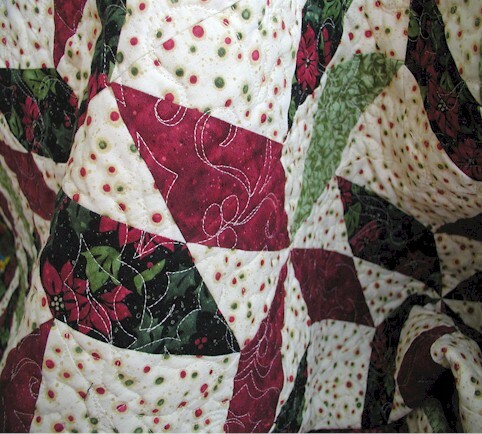 ); Fusible: Steam A Seam2 by Warm Company; Pattern – found in Quilter’s World‘s December 2010 issue; Finished size: 50″ square. 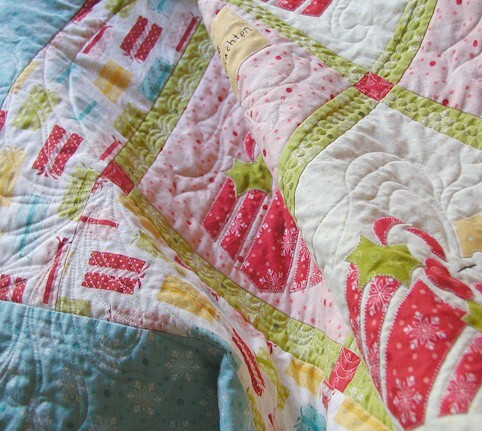 This was a super fun quilt to make. I would love to know if you do make it too! 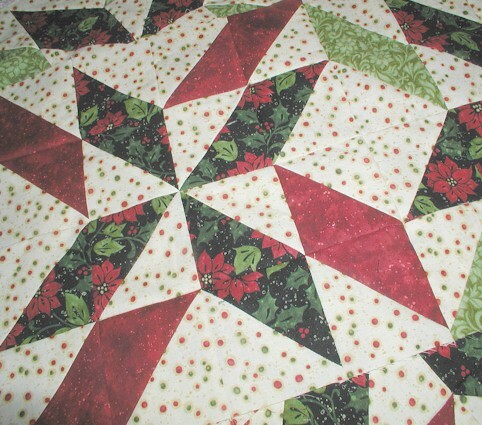 I am trying to find out if it would be possible to kit this project at this time. 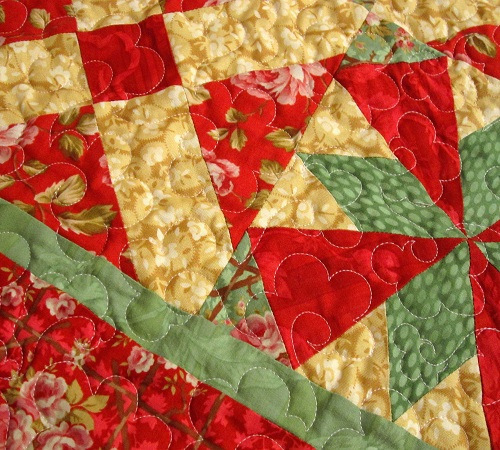 So if you are committed in purchasing a kit, please email me at wendy2@wendysheppard.net. Thanks for stopping by. Have a lovely day and week! 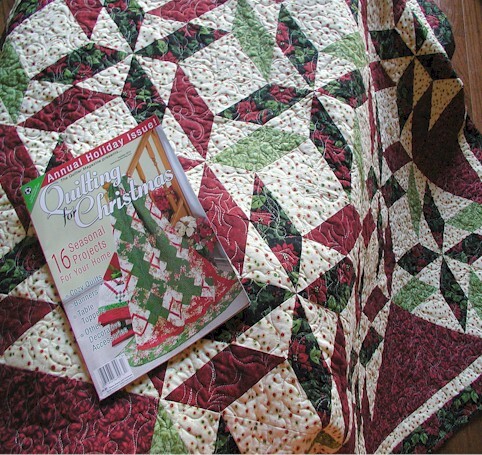 I have a second quilt featured in The Quilter‘s Quilting for Christmas issue — my Holiday Spinners! 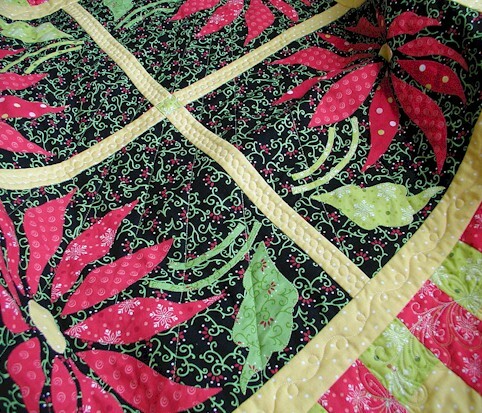 This was a fun fun quilt to make because I liked the fabrics very much. 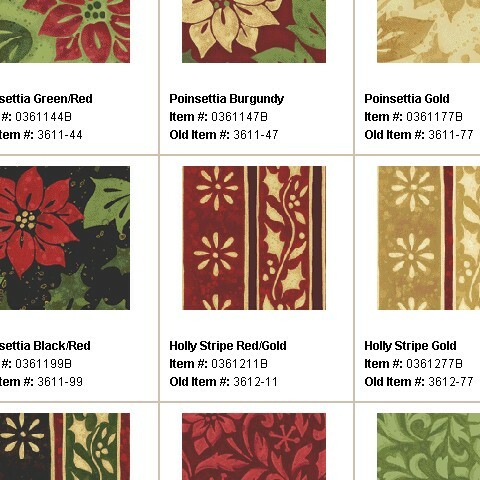 Oh, look at the poinsettias on the fabrics – shocker! 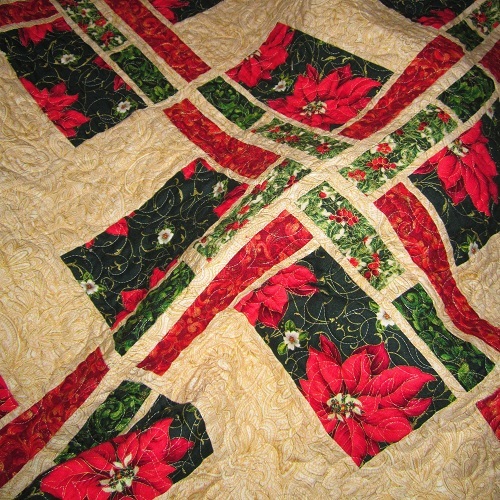 ;) (Click here to see my other Poinsettia quilt featured in the same magazine). 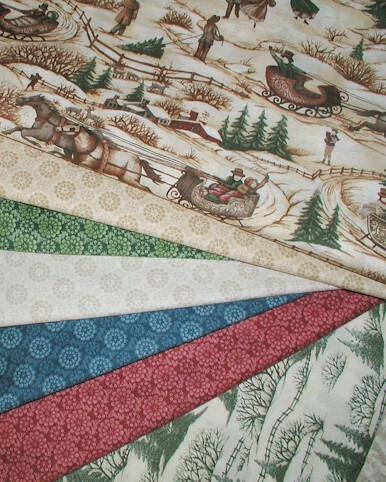 These fabrics are from Benartex’s Noel collection. 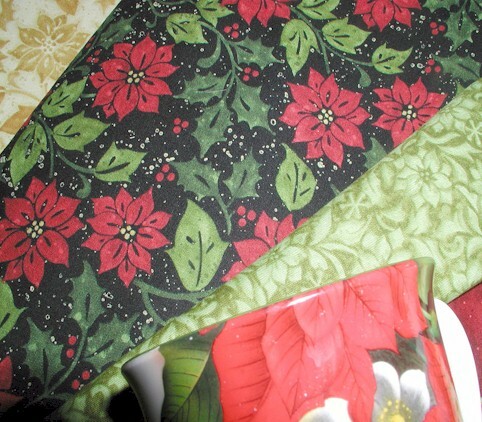 If you like black accents in your Christmas decorations, you’ve got to get some of these fabrics. 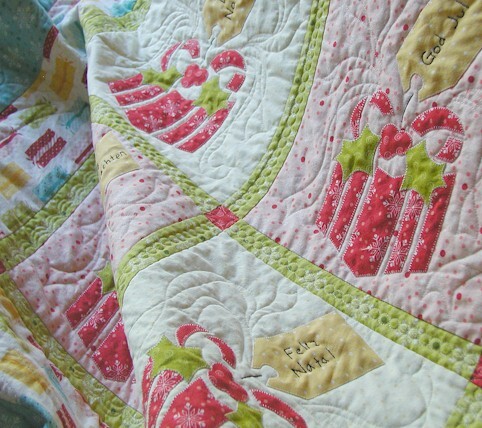 Quilt kits are available from Heartbeat Quilts. 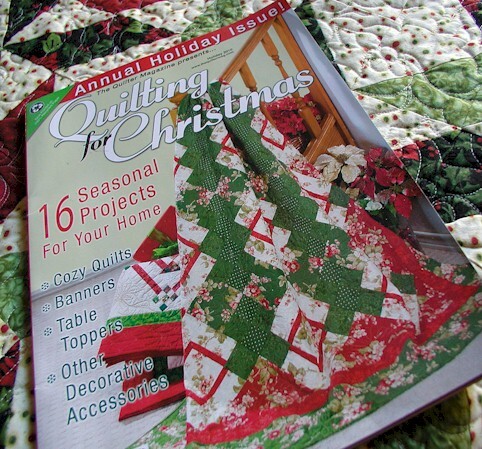 I was told by the people at Heartbeat Quilts last week that the kits are rather popular – of course, that just sent me into the clouds! 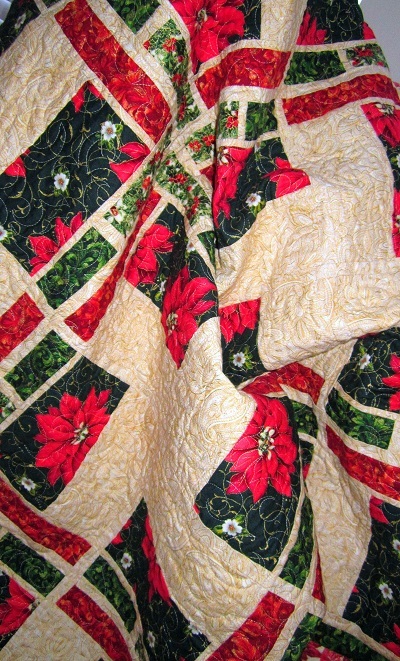 This quilt, along with Poinsettia Fiesta, will be displayed shortly at Heartbeat Quilts in Hyannis, MA until early Jan 2011. 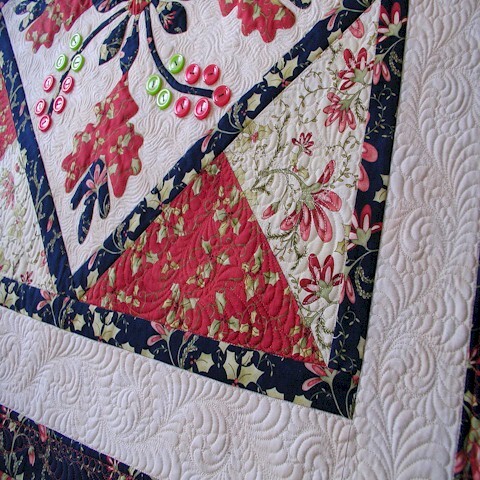 I set out to imitate the big girls’ (the longarmers) quilting using my little home domestic machine and quilted holly and berries all over the quilt. 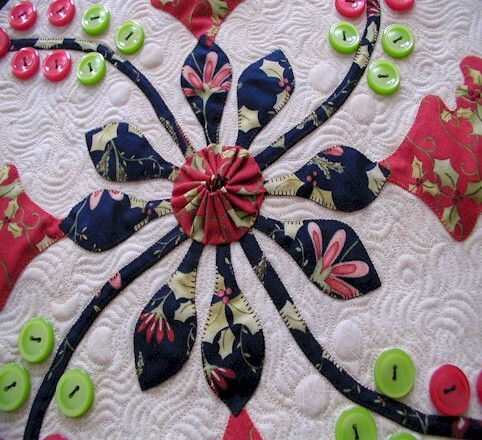 It was a bit of a challenge because with my domestic machine, there was only so much space I could see around my needle for a rather widespread motif. 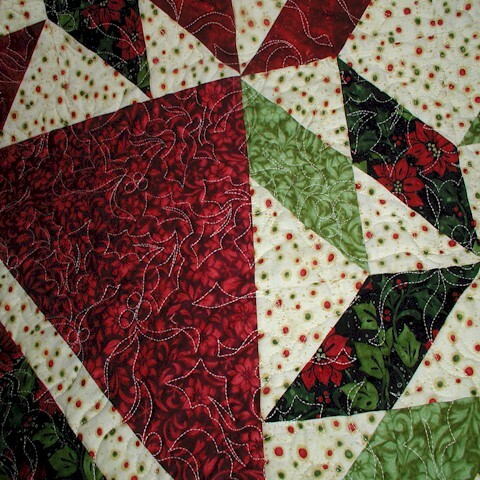 One of these days, maybe I will get myself a longarm… but for now, here are some snapshots of the quilting. 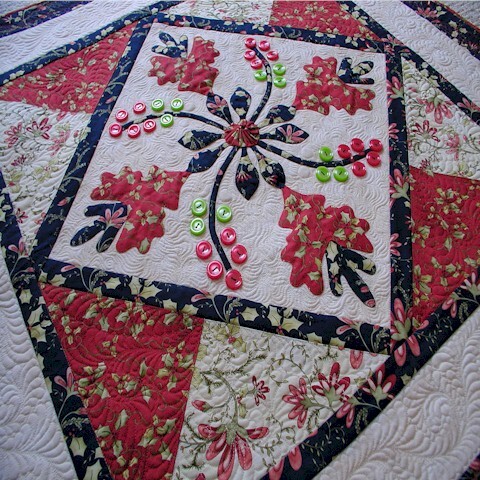 I used Aurifil‘s Mako 50 Cotton over Hobbs‘ Tuscany Silk Batt. 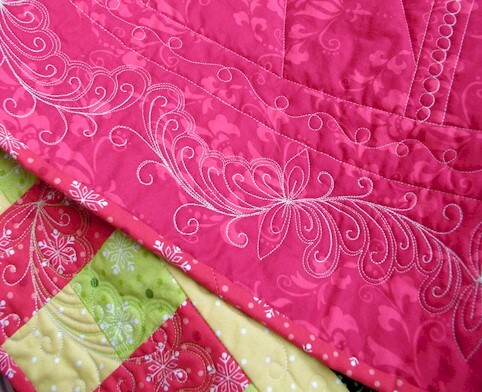 You may read about my take on Aurifil’s thread here, and Hobbs’ Silk Batt here. 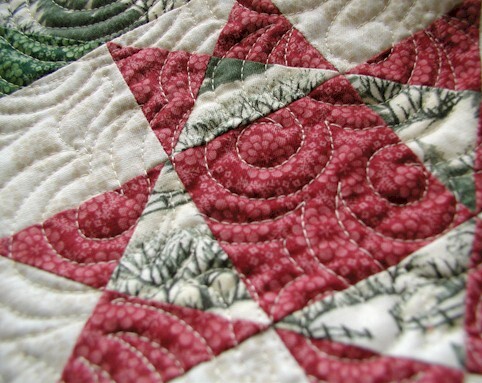 This concludes the series of quilts I did for The Quilter this year. It’s hard to believe a year is almost over. 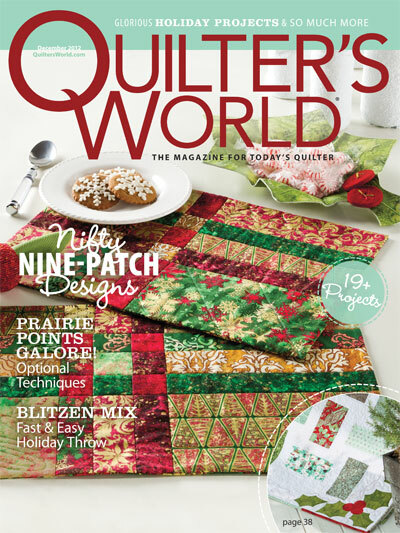 I have had the greatest time working with the wonderful people at The Quilter. 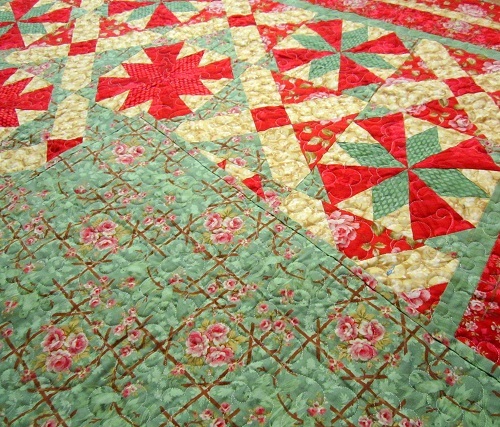 I will do a recap post of all my quilts in The Quilter for 2010 in the near future. Stay tuned! 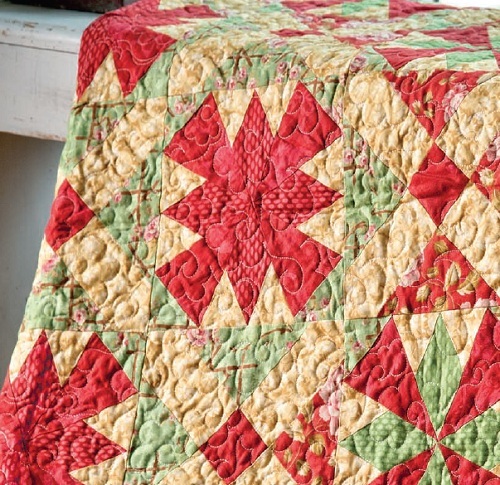 This quilt uses fabrics from At Home for the Holidays and Hip Holidays by Henry Glass. 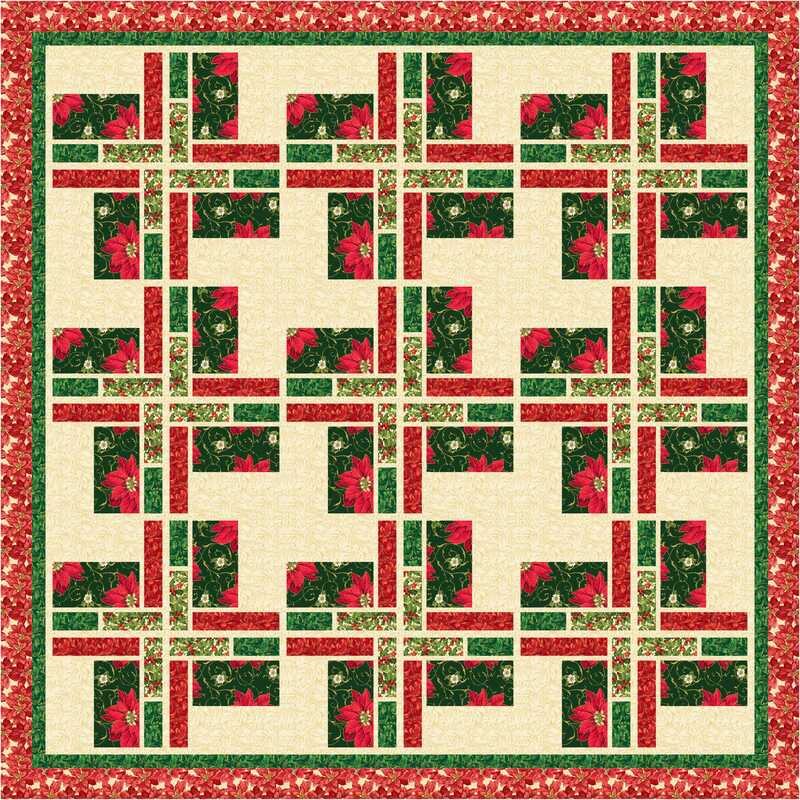 These fresh color palette gives a very cherry and slightly different look to the traditional Christmas green and red colors. And I love the effect. 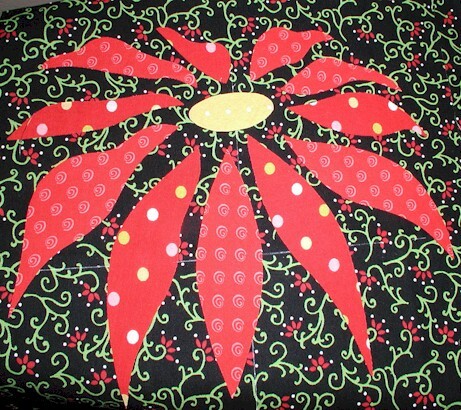 This 36″ x 36″ wallhanging/table topper was fun to put together. 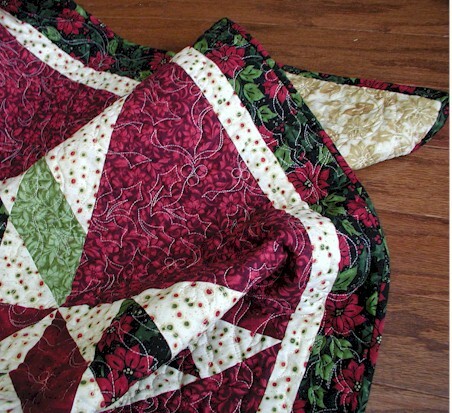 What was even MORE fun was quilting it! 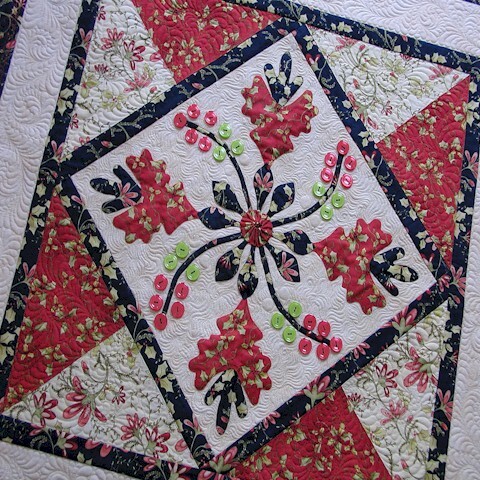 I used Hobbs‘ Tuscany Silk Batting and Aurifil‘s Mako 50 Cotton threads. 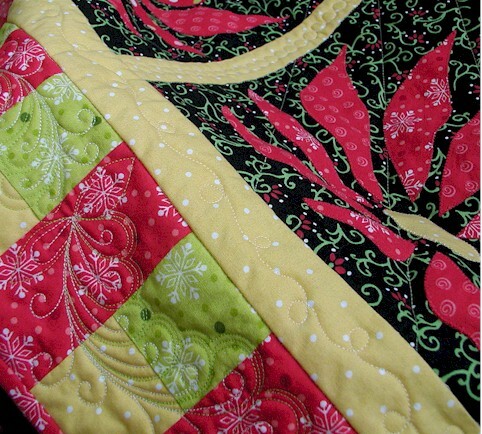 Again, I quilted this quilt on my domestic machine. 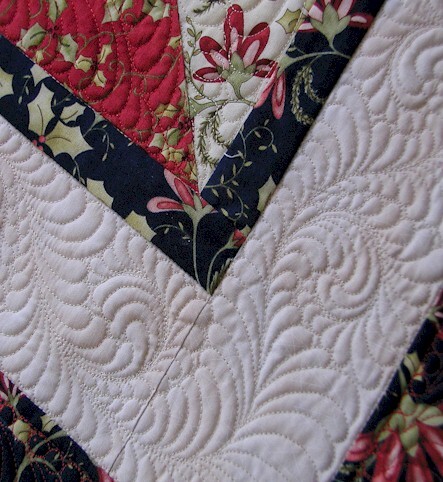 The feathers were “hyper-quilted” with green and white threads. 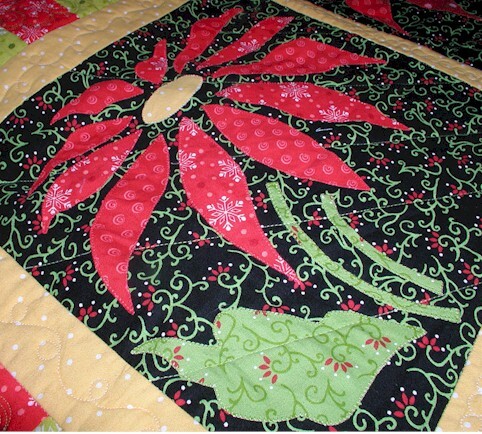 Poinsettias are one of my favorite Christmasy things to include in my Christmas decorations. What is/are yours? Thanks for stopping by. I am slowly working on responding to your emails/comments in the reverse order they are received. Have a lovely day! Black has struck again!!! 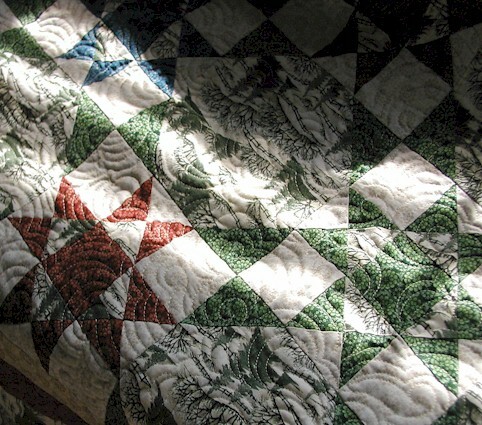 Remember my “black in quilts” post last week? I am a bit shocked to find yet more black in my latest project. 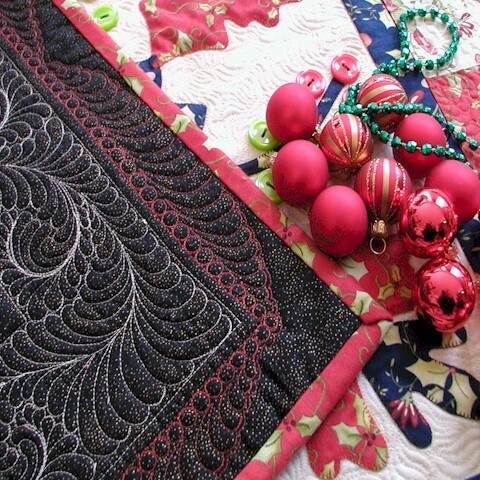 I guess until last week, I just haven’t been cognizant of my use of black fabrics in my quilts. 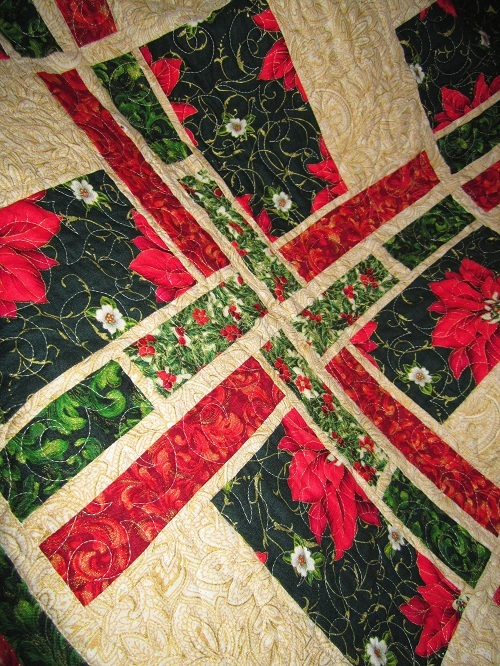 And what do you know, it is another Christmas quilt. 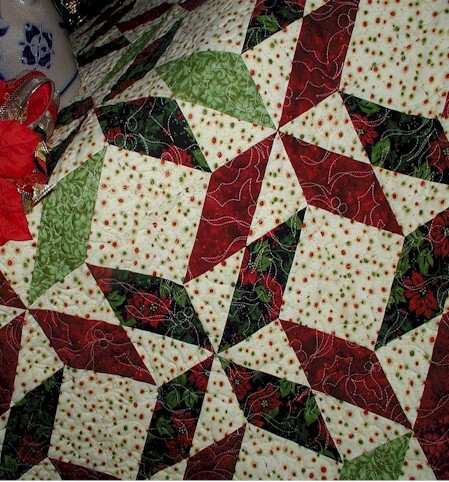 So far all my quilts that have black in them have been Christmas quilts. I am liking it so far! 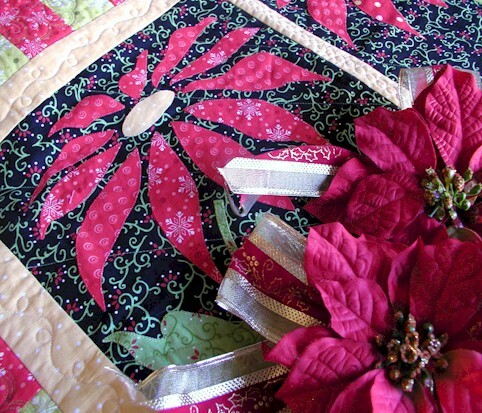 This is a Christmas project that has the traditional theme of poinsettia and colors, but with a slightly non-traditional look because of the super bright fabrics! Stay tuned for more pictures. 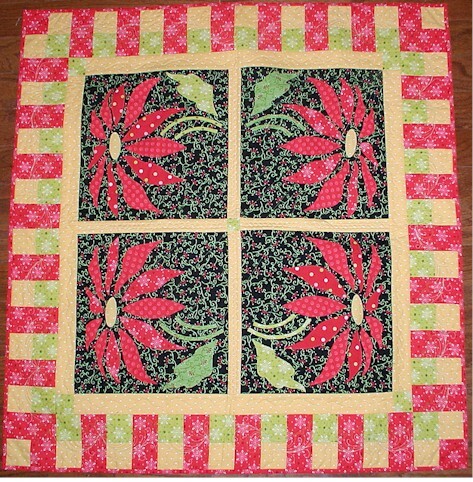 Meanwhile, I am back to getting all the blocks done before the day is over. 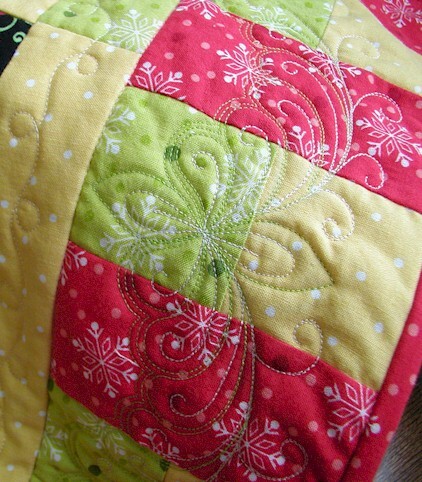 So, this is what I ended up doing – my favorite curly q allover design. 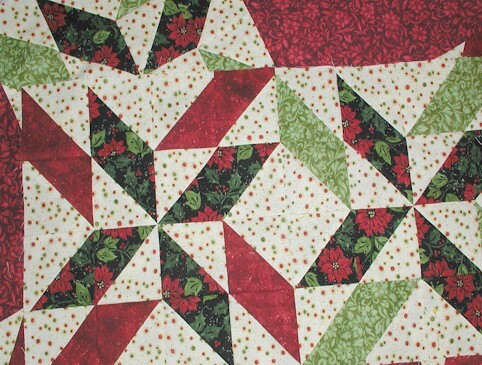 I wanted the snowball blocks to have just some texture, and not anything fancy to draw the attention away from the fabric prints. 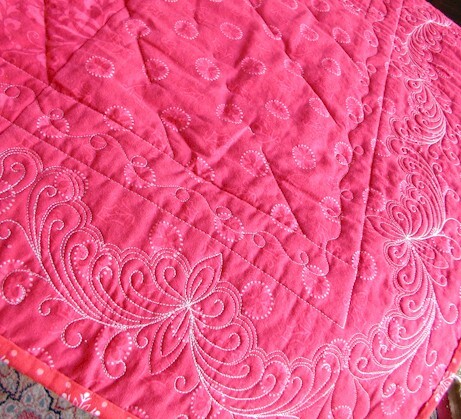 That’s why, in the end, I did the allover design. 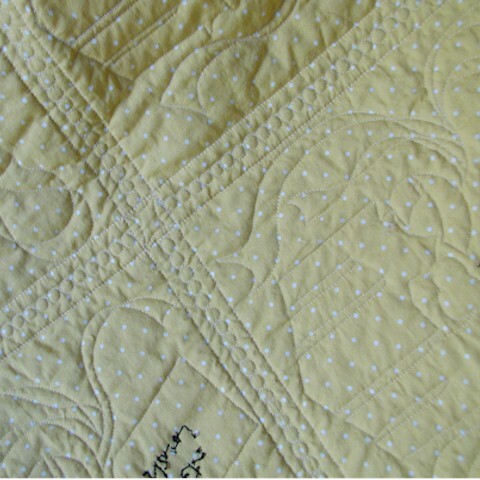 Since I have kind of personalized the curly q to my own liking, the quilting actually went really fast. 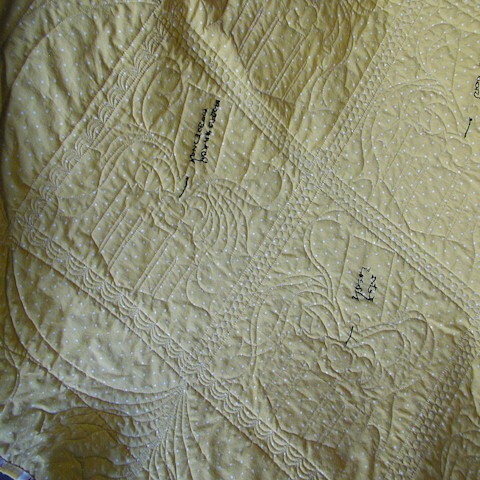 I ended up being on schedule, even with the post-quilt details (writing the article, organizing diagrams etc.) to which I have to attend. 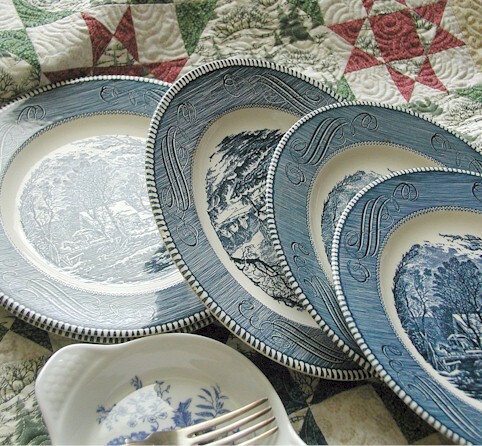 Of course, I had to drag out my Currier & Ives plates. I don’t have many, and a couple of them are dinged at various spots. 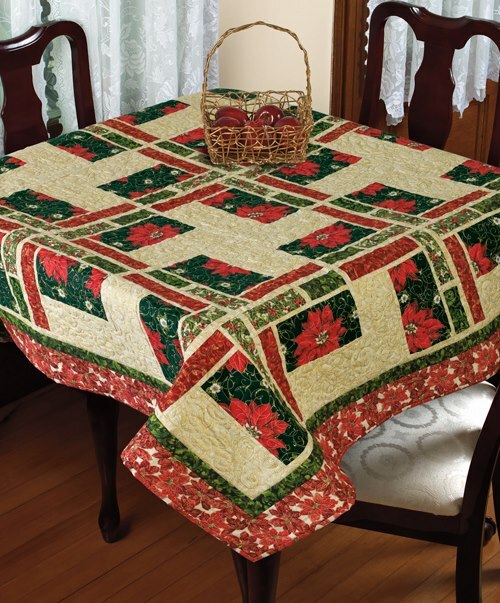 But they make a nice cozy placesetting during the winter time. 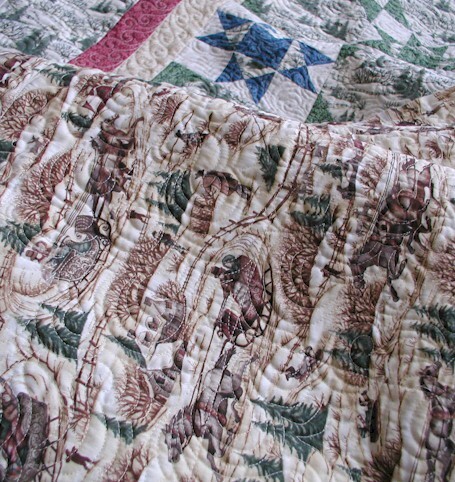 This quilt is off to the editor. 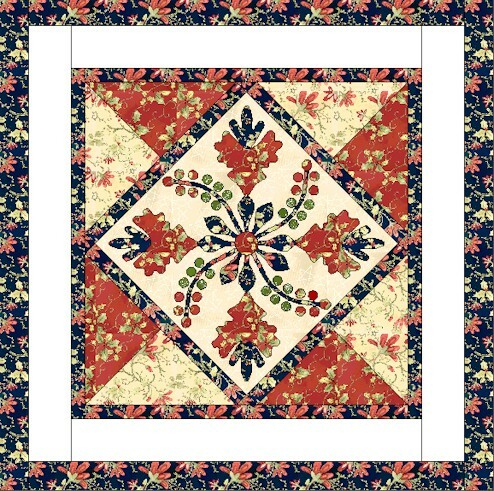 It will be featured in Fons & Porter‘s Easy Quilts later this year. More on that as I receive more details.